Conflicting theories about how Belarussian President Alexander Lukashenko could take political advantage of the recent attack in the Minsk Metro abound. While local pundits doubt anything significant political changes will occur, Lukashenko has indicated that officials have only themselves to blame for what happened. 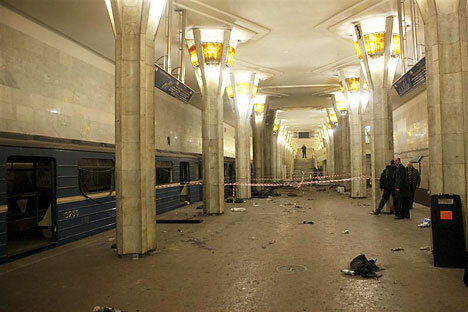 The explosion that ripped through Octyabrskaya metro station yesterday in Belarus’ capital of Minsk killed 12 people and wounded 157, of whom 22 are in critical condition. Earlier today, Belarus’ Prosecutor General informed the President that terrorists were behind the attack and that an investigation had been launched. “There are several theories,” wrote Pavel Sheremet of leading Russian daily Kommersant. “One puts it down to a conflict between different special services. The terrorist attack may have been provoked by a clash between the old timers and the younger officers. The next theory links the explosion to the economic situation in Belarus. The past two weeks have seen panic in the country’s currency market. After the terrorist attack, Russia will extend a helping hand to its neighbor and Europe will put on hold a plan to impose sanctions. The authorities stand to gain from the whole thing,” he said. Belarusian political scientist Alexander Feduta believes that the government has no appetite for cracking down on the opposition in light of last December’s street disturbances in Minsk. “There are no radical forces in Belarus that are interested in rocking the boat. The authorities aren’t interested in using the attack to ‘tighten the screws,’” he said. Alexander Lukashenko told the defense and security ministers yesterday that Belarusian authorities shared the blame for what happened. “There are no excuses. We have only ourselves to blame for what happened. We have failed, as has always been the case, to ensure calm, even if it is only in one particular place in our capital. We must do everything to make sure that people do not come to think we are not earning our keep,” Alexander Lukashenko said. Shortly after the tragedy Dmitry Medvedev called Lukashenko to express his condolences. The Russian President offered help in investigating the incident. Russian medical teams have been sent to Minsk. A similar attack occurred on July 4, 2007 during a gala concert to mark Belarusian Independence Day when a homemade explosive device went off in Minsk. Fifty-five people were injured in the attack.